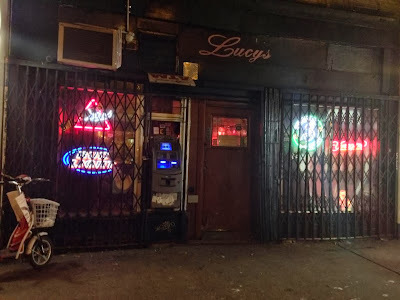 Lucy's, one of our favorite bars, had been closed of late on Avenue A … likely on another customary break ... before Thanksgiving, we spotted a sign saying that the bar would be reopen on Dec. 6. But, as far as we know, that never happened… and the bar remained closed… including last weekend. (Who could blame her.) A reader spotted a sign on Dec. 13 saying closed, and instructing people to go next door to Doc Holliday's. Still not open as of Wednesday. There was understandable concern. However, last night, Lucy was back… and it was really nice. I can't go back to Lucy's. Too many memories of people who passed away. Faint cheering heard all the way from Scotland, the very best news.